When it comes to solving your time maintenance issues, Network Time System provides the answer. This is powerful client/server software which enables you to create a virtually fail-safe synchronized time environment for networks of all sizes and complexities. From those who use single site and small office networks (LAN) to those who employ large enterprises (VLAN, VPN, and WAN) that include numerous domains and use complex routing techniques, Network Time System pulls everything together. Basically, this means that Windows Network Time Server creates a custom source of precise time found in a corporate network environment which synchronizes every machine and device in the company. The establishment of this time server or time client coordinates all activities on the network so that there is no differentiation in terms of time synchronization. The advantages are significant when you consider networks of logging servers, POS terminals, workstations, Kiosks and the like. By having everyone on the same time, you create greater efficiency in your company. There are a number of excellent features incorporated into this system, which makes time synching a powerful part of your business efforts. Both the Server and Client are native 32 and 64-bit compiled executables and will run with all versions of Windows from Windows 2000 up to Windows 10 and Server 2012. This will allow or deny users to configure the Network Time System Client in a direct manner with the Network Time System Server interface. You can set up a single or multiple time server units that are capable of overseeing thousands of time clients. It includes workstations or NTP server, NTP client or SNTP compatible devices. Allows for customization of source time such as when received from an NIST Time server and distributed to other time clients. You can keep the time synchronized by converting it to local time or using the UTC. This allows you to add or subtract any number of seconds/minutes/hours from the source time so that you can create your own unique time offset. Network Time System supports the most widely used NTP/SNTP and NMEA 0183 as well as its own proprietary time protocol for maximum flexibility. You can deploy the Network Time System Client through Group Policy to all Windows-based computers in just a few minutes time. In addition, the system itself is quite intuitive and easy to use making it very valuable to any small to large companies. You can install, move or delete your licenses whether they are original, additional or updates in an easy manner using the built-in license manager. In addition, this feature will allow you to distribute as well as synchronize all of your licenses across the network making updating a very simple matter. Why Time Sync Software For Windows? 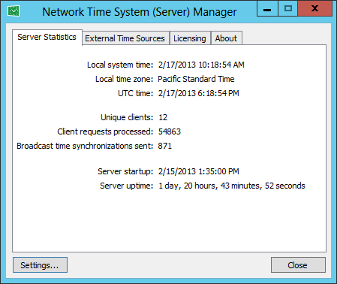 Network Time System as handled through the NTP Server and NTP client for Windows provides a valuable tool for synchronization of all devices on the network. The advantages of this system are considerable for companies of all sizes, from small to large corporations, download trial version today. Copyright © 2008-2019 Softros Systems, Inc.